Addyson and Katy- Best Buds! Meet Addyson. Blonde-haired, blue eyes and rosy cheeks- she could not look more different from Katy, if she tried. 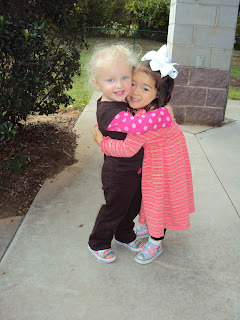 However, don't let looks deceive you because Addyson and Katy are best buds at Preshool. From sitting together at lunch, to playing together at centers, Katy loves her little friend. Up until this point, Katy's "friends" have been the children of our friends. Katy didn't really get a say in the matter. So, it's fun and interesting to see what kind of people Katy chooses as friends.